What The Hell Does An Internet Marketer Actually Do…? 1) The fact that people are always asking me it is I actually do! So, today I’ll be attempting to demistify the world of internet marketing and explain exactly what a full time internet marketer fills his days with (Hint: It’s not all coffee, cake and snowboarding). Successful internet marketing will generally require a great deal of content. And by content here I mean letters, words, sentences, paragraphs… all put together in a cohesive, witty and engaging style that will help towards the fulfillment of an end goal (be that a sale, clickthrough, sign up whatever). The average novel is around 80,000 words long and takes anywhere from a few months to a few years to complete. Certainly a novelist who releases one book a year would be considered prolific. There are around 250 words per page on a standard book. So, the text content on this site alone runs to the equivalent of a 428 page book, which would be an above average novel. But wait, don’t you outsource all that? While there are those who will advocate outsourcing everything, the mantra that ‘you get what you pay for’ is certainly true in internet marketing. To clarify, I write all my content and am fortunate enough to actually enjoy writing. Indeed I would consider it a passion of mine. If you have the budget, there are certainly good freelance writers out there for hire. If you think however that you can pay a couple of dollars for dynamite content that will help you on your way to your first million then you are likely to be disappointed. As your content will generally be what earns your revenue (either directly or indirectly) it has to be original and it has to be exceptional. With this in mind I very much subscribe to the old saying ‘if you need a job doing right, do it yourself’. Ok, writing about SEO doesn’t require the same imagination and intricate plotting of a Stephen King novel, but well written content takes time, focus and a certain creative spark. So, I spend a lot of time writing. Knowledge is power and to be successful in pretty much any niche you have to be on the ball with what is going on. The SEO niche is certainly one that is a moving feast. While the fundamentals remain the same (create great content and get it in front of the right eyes or write words and get links depending on how you want to put it) there are intricacies which change all the time. During the process of writing my recent article on SEO facts and myths for example (which ran to over 13,000 words and took a month or so to complete), there was information released by google which changed the thinking of some well respected SEOs on a couple of key issues (social signals and guest posting). While I may not necessarily agree with this new thinking (I still think social signals are a factor and believe guest posting to be alive and well) it was important that I was aware of google’s statements, otherwise I may have been giving outdated advice. When you are trying to build your reputation as an expert, you have to make sure you are giving correct advice, or, where there is a contention, make sure you can back up your point of view! Whoa! You bounder! You cheat! Well, hang on a second. Put that rope down and allow me to explain that statement before you condemn me to the gallows. I study successful websites/people in my niche. If a certain post on a high profile blog has attracted a load of attention/shares/links, then it generally follows (though not always) that similar content on your own site can be successful. Of course, being able to combine 2 or 3 of the above is the ideal scenario. Let me give you a real world example from this very blog! One of my most popular posts to date has been my post on how I built a niche affiliate site. 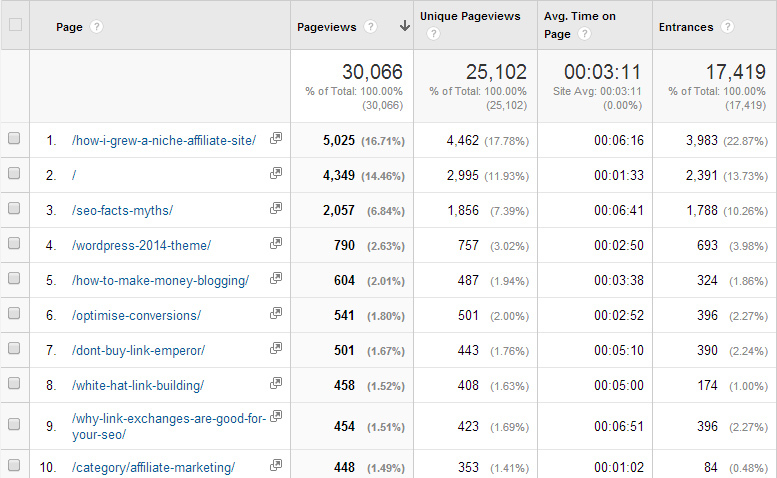 In fact, looking at my stats, it continues to be the most viewed page each month (outperforming even the home page). I mentioned at the end of that tutorial, that it had been inspired by Matthew Woodward’s post on how he had built up his blog. ‘In 12 Months’ – Didn’t take long! ‘& How You Can Do It Too!’ – The important bit… nobody wants to just read about how someone else is successful, they want to be able to do it for themselves! How I Lost 14lb In 6 Weeks & How You Can Do The Same! How I Aced My Driving Test In 4 Days & How You Can Too! How I Became An Expert Pianist In 12 Weeks & How You Can Do The Same! It works for anything really. Boast about an achievement and promise to show the reader how they can achieve the same. Quick addition on that… make sure that you deliver on your promise. Ensure that the claim in the title is true and that you really do show the reader how they can do the same, otherwise you will just end up with disappointed visitors. So, that is an example of how I took one of the most popular pieces of content on a top blog in my niche and used the same format to turn it into a traffic generator for myself. This is very important when you are launching a new site, or looking to get an existing one off the ground. Here are some questions you want to be asking…. How are the big boys where they are? Who is linking to them? Who is writing about them? Who are they interacting with on social media? Where are they most active? You will often find that the top 2 or 3 players in a niche will be following a similar strategy, so if it is working for them you can be pretty sure that it can work for you. I spend hours and hours tinkering with things. Familiarity breeds contempt and since you will inevitably spend a lot of time staring at your own site you will quickly grow to hate it. Would increasing the font size from 15px to 16px increase conversions? Would a background colour of #f3f3f3 look better than a background colour of #f3f3f4? And you will change them. Then you will change them back. *Occasionally* your tinkering will pay off. … maybe a purple sign up box would be better…? I have been involved in internet marketing for around 16 years. By now I should be killing it every time, right…? Ever get that feeling that you are smashing your head repeatedly against a brick wall? You will have a lot of days like that. There will be days when you hit publish on that amazing, killer piece of content you have been slaving away on for weeks, sit back in your chair and confidently waiting for the inevitable flood of traffic, sales and links. When you have those days it’s important not to lose heart. Not to give up. Never give up. Why did the content not take off as you thought it would? You go in, you do a day’s work and you go home with a day’s pay. Unfortunately some people are so entrenched in this way of thinking that they cannot comprehend any other way of working. An internet marketer, indeed any entrepreneur, is capable of thinking differently. Unless you are very lucky, building a business takes time. Thinking in the medium/long term is one of the key factors which separates the good internet marketers from the bad. The successes from the failures. Let me give an example by going back to my article on SEO facts and myths which I mentioned earlier took me around a month to put together. He just could not comprehend why I was spending so much time on something that wasn’t designed to bring in immediate, guaranteed, direct income. So what were my goals with the article and was it successful? Well, at the time of writing (2 weeks since publishing) it has been shared around 327 times, had a couple of thousand page views (still going strong), attracted quite a few citational links and my subscriber count has grown nicely since publication. Oh, and while it wasn’t the main aim, it has also picked me up some SEO consultation work – bringing in direct income of around £600. Why am I giving away all this free content? That’s all well and good you say, but clearly, the whole point of internet marketing is to make money right? I get emails most days asking me to promote this, that or the other SEO/internet marketing product (on an affiliate basis). To date I have not yet been suitably impressed by one that I feel I want to introduce it to my subscribers. As someone who has been self employed for 8 years now, I know exactly how precious every penny is when you are starting up, so, you can be sure that if/when I do advise you that a product or service is worth spending some money on that it will be bloody good! Additionally, in the coming months I will also be offering a variety of premium content/tutorials. These tutorials might take the form of standalone eBooks or perhaps be available as part of a subscription (I haven’t decided 100% yet). Considering I give away 13,000 word articles for free, you can bet that these will be incredibly valuable resources that will guarantee results – be that direct income or increased traffic. I can sum up the most important factor in making money online in one word. If you don’t gain the trust of your audience you will never make any money (at least not in the long term). Demonstrate my expertise: hopefully my 106,825 words have demonstrated that I know what I am talking about! Genuinely help people: I don’t write just for the sake of it. I put a great deal of consideration into everything I publish and aim to offer actionable, easy to follow advice that will get you results (when you put in the work!). Building trust, like growing a business takes time. Period. I probably spend an hour or so a day giving people advice by email, answering questions in comments etc. I am not talking about SEO consultation work here; just general two line answers to questions/queries. Why? Well, a big part of success in internet marketing is about being nice. If you have any questions by the way, feel free to drop me an email. 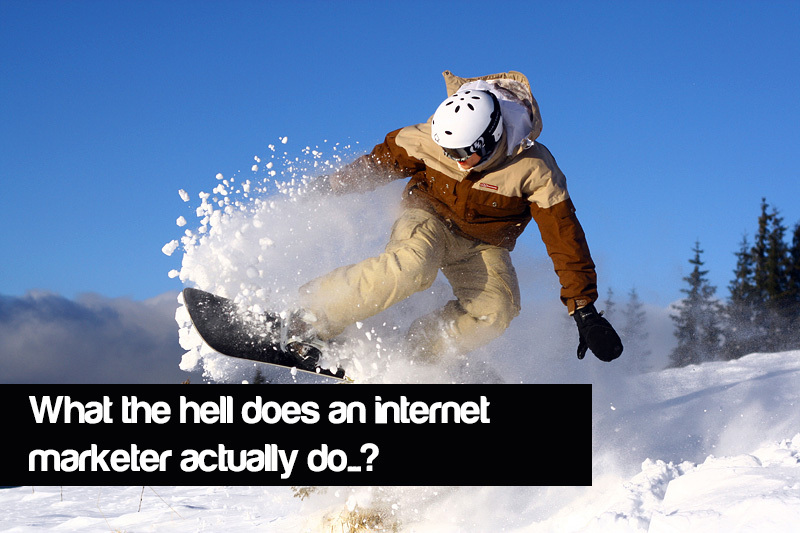 Successful internet marketers work an hour a day and spend the rest of their time snowboarding right? Well, some might, but most will lead a somewhat different life. Ignoring family commitments, I often hear friends in 9-5 office jobs talking about how they have no ‘free’ time. Is that really the case? Well, for a start, most will have a weekend (or 2 days off at some point in the week). 2 days where they will (generally) switch off completely from work and get to do whatever they want. They will also have at least a few hours of free time in the evening and 5 weeks or so of complete down time each year. That sounds pretty sweet to me. While there are days that I will do more work than others (16 hour straight no food/no sleep marathons are not uncommon), I pretty much work in some capacity 7 days a week, 365 days a year. Even if that is just an hour catching up on emails and fretting over stats I am never really truly disconnected. I was recently visiting the north of Scotland and almost went crazy at the lack of a 3g internet connection on my phone. That’s not good when you are supposed to be enjoying a relaxing hill climb and recharging your batteries (metaphorically of course, I made sure my phone was fully charged with a spare battery just in case…). At the time of writing I have never been snowboarding. Let’s finish this off on a positive note! Internet marketing is hard work and can be frustrating at times, but it is also highly rewarding. I have attended one job interview in my entire life (I got the job) at the age of 16. I stayed in that position until I was 25 and have been self employed ever since (I’m now 33). I don’t envisage ever attending another one. I’m sitting writing this post while wolfing down a triple chocolate muffin and sipping on a smooth filter coffee. I’ll be working late tonight, but will be taking tomorrow morning off to play a round of golf (Spring has finally sprung in Scotland). I love writing, I love helping people, I love making connections, I love working hard, I love seeing my traffic grow, I love making those first sales or commissions on a new site, I love the fact that I can (literally) make money in my sleep. The world wide web celebrated it’s 25th birthday last week. What would I be doing if I wasn’t an internet marketer…? … I really don’t know. So What Does My Mum Think I Do? Top 5 SEO: Ensuring people can find red shoes since 1998. For loads more free internet marketing and SEO tips sign up for my mailing list below. Love where you are coming from – I am on a similar path and a current project is interviewing successful start ups and sharing their stories online. People ask me “but why do it for free?” and I explain along similar lines – it almost starts to sound a bit Buddhist and like “the secret” but it is simply true – by sharing and demonstrating your commitment to a niche you are establishing yourself as an authority. Most people complain about the dip in income in starting a new project – for me it is a time to reflect and find pleasure in less instead of always chasing more – as Socrates once said. And coffee… espresso keeps me going :-), switching to whisky in the wee hours (the inspiration behind some of my best posts). I’m sure I’ve produced a few whisky inspired posts in my time! I just forwarded this post onto my Mum, as she’s always asking what it is I do. I got a reply back: “Still don’t understand”. Top post as usual, David. Medium to long term thinking and goal setting is definitely a prerequisite of internet success. In my personal experience, it has been really tough seeing minimal revenue come in but I know that things will pay off soon. This journey is certainly tough but definitely a labour of love. The thought of having the lifestyle you’re enjoying at the moment is my biggest driving force.